If you search your ancestors in Carlentini, Sicilia, info about your Italian family are stored in the City Office archives or at the parishes. In towns and villages of Sicilia and in Siracusa province registry offices were established around 1820: it means that you could find information in Carlentini registrar as of that date. So, if your ancestors were in Carlentini in the nineteenth or twentieth century, then you could try to contact the City Office of Carlentini to know more. 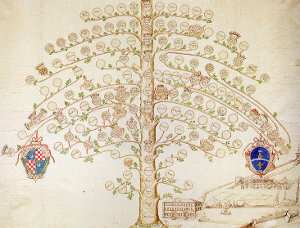 Before to start your genealogy research in Carlentini, we suggest you to read our tips for your search . They are useful to search in sicilia and in Carlentini too. 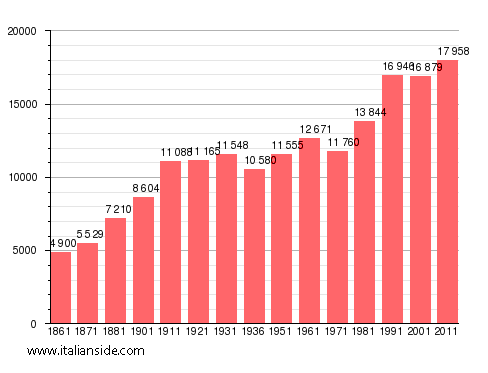 Next picture shows the demographic trends in Carlentini from the Italian Unification (1861) an important info to understand how many people lived there in the past. It could be important to know if the last name you are investigating is a frequent surname in Carlentini. As more your surname is common in Carlentini, as more it could be difficult to find the right info about your ancestors in Carlentini archives if you have not exact dates. Amato, Amenta, Basile, Bianca, Bottaro, Buccheri, Calvo, Campisi, Cannata, Caruso, Di Mauro, Di Pietro, Di Stefano, Gallo, Garofalo, Genovese, Giuliano, Grasso, Greco, Italia, La Rosa, Leone, Lombardo, Magnano, Marino, Messina, Miceli, Pappalardo, Parisi, Passanisi, Puglisi, Rametta, Randazzo, Rizza, Romano, Rossitto, Russo, Salemi, Salerno, Saraceno, Scala, Spada, Tiralongo, Tringali, Valenti, Valvo, Vinci, Zappulla. Church archives in Siracusa province may instead contain even older information, but they are far less accessible from abroad (and almost impossible by email). If you have the opportunity to visit Carlentini and Siracusa province, you could plan to investigate churches’ archives by yourself (or with us! ), but from abroad is very difficult to obtain any result unless you find a reliable local help. If you have the opportunity to visit Carlentini and Siracusa province, you could plan to investigate churches’ archives by yourself, but from abroad is very difficult to obtain any result unless you find a reliable local help. If your research is in a dead end and you need professional help from our local Italian genealogists write to carlentini@italianside.com our expert in Carlentini area will study your request and will reply to you with a research plan and a quote. My grandfather came to Ellis Island in 1907 as a baby, with his mother. Our name in the USA is DINZOLE, but I believe in Carlentini our surname was Inzalone or Anzalone. I am of the third generation. I believe the ship may have been the Germania. My mother’s side is well documented back to the 1600’s. My Italian side ends there. Beginning genealogy and I guess want to know how I can view real documents from Carlentini. I AM LOOKING FOR INFO ON A GUISEPPE GARRO NOT MARRIED WHEN HE CAME YO AMERICA ?MARRIED A MARIE (MARY) HE HAD A SISTER NAMED SARA WHO ALSO CAME TO AMERICA HE HAD A BROTHER NAMES PAULO ALSO TO AMERICA I DO HAVE INTENTION PAPER’S ON THE 2 BROS.DATED 1921 GUISEPPE WAS BORN IN 1899… ALSO A ROSA (MALE)? WHO WAS A MOTHER-IN-LAW MARRIED A GARRO WONDER IF THEY ARE FAMILY IN SOME WAY SHE STAYED IN PA.BORN 1877 INFO SAID SHE MARRIED A JOSEPHINE GARRO.. BOY AM I CONFUSED HELP!!!! I am currently looking for any information on my great grandparents who traveled to the United States from Carlentini in the early 1900’s. My grandmother has passed away and I have been left without much information on her family from Italy. I travel overseas a few times a year and I am truly hoping to gain my Italian Citizenship so any kind of paperwork would be helpful, yet my hopes are to find a birth certificate. Unfortunately, my father’s side was naturalized prior to 1912 so I have come to a dead-end with that research in terms of dual citizenship. Hi Angela, what is your grandmother’s name? and if you have any other names and where their destination in america that will help too. I am looking for information on my Grandfather John Sebastian Sesto. He was born Sept 6,1900 or 1901. He came to the United States. I was not sure if any other relatives stayed. I will be in carlentini with my husband this summer. My great-great-grandmother came to Omaha with two daughters. She left a third behind to be raised by her grandmother, my great-great-grandmother. I’m looking for birth and wedding records of any Lucia Puglisi or Crucillo. The daughters she brought over were Maria Puglisi and Sarita Puglisi. I can’t figure out why my great-great grandmother had a different last name than her daughters. Hi Sheri, are you in Omaha? My Nani and I are looking for more information about her Dad’s family from Carlentini. I wonder if our families knew each other in Omaha?! I would like to consider hiring someone in lentini and carlentini to find additional information regarding relative who died prior to the 1820 Civil Registrations. I have quite a few about 29 persons. I am coming to Carlentini on Monday April 18th. My great grandfather is Sebastiano Sacca born on May 9, 1903. I’m looking for his birth certificate. His parents are Di Alfio Sacca and Giuseppa Castro. I’m also looking for their marriage certificate, birth certificates or any other documents. Please let me know if you can help! Hello, I am searching for information about my Great Grandfather and Great Grandmother. Re: my Great Grandfather: His name was Salvatore Narzisi. He was born in 1885. I have found that he emigrated from Carlentini (arriving in New York) in Feb. of 1909. He was 24 when he emigrated and was listed on a ship manifest as: ‘single’. Re; my Great Grandmother, I have far less information other than her name which was: Cristina Creta. I believe that she was born in 1887. I know that she was NOT married to Salvatore in Sicily…she may have been married to another man at the time. It is also my understanding that she emigrated earlier than Salvatore and that she left behind a daughter. Any assistance regarding my family history would be most welcome. I learned that my grandfather Antonio did not live w my grandmother. This has made me realize I have cousin. Case in point. Met a Franco who looks like my dad and striking resemblance to my brother and son. His grandfather was Antonio Franco of Sicily. Any coincidence? Franco was not popular in Sicily then. Would like to learn more. I am trying to find information about my grandfather- Filadelfo Franco. He was born in Carlentini on May 4, 1893. He emigrated to America in 1913 and went to Omaha, NE. I have tried to find any information about his family. I have had no luck finding any information. He left behind 2 sisters. .
Hi Susan, I’m in Omaha too and know some Francos 🙂 My relative Rose Monaco married Luciano Franco. Looking for information on my grandparents – Giuseppe “Joe” Sesto (born July 6, 1892) and Lucia “Louise” Franco (born June 17, 1902). They were both from Carlentini. Giuseppe’s parents were Pietro and Maria (Scapellato) Sesto. Lucia’s father was Salvatore Franco (haven’t been able to find her mother’s name. Any help would be greatly appreciated. I’m looking for information about my great-grandmother, Maria Micelli de Arago (?). My uncle has a close genetic match with Cyrus Scapellati who was listed as being born in Carlentini on the 7th January 1892. When he got his call up papers he listed Castis Pignano as a friend from his native country. He also listed his occupation as Divinity student and became a Presbyterian minister. Do you have any information on his family, to which my uncle would belong, from his (my uncle’s)ancestor who was born in 1867? I have found out that my husband’s great grandfather was Mariano Mazzarese who married Rosaria Randazzo. His other great grandfather was Sebastiano Caniglia who married Alfia Vacirca. Sebastiano’s parents were Rosario Caniglia and Carmela Marino. Alfia’s parents were Vito Vacirca and Salvatora Scapellato. They were all from Carlentini. Do you have any info on them? If you would like to start a research in Carlentini please send your request to carlentini@italianside.com.